Released on November 22, 1968, The Beatles’ self-titled ninth studio album became known as the White Album due to its distinctive plain white cover. It spent 16 weeks at number one in Australia. Opening with Paul’s ‘Back In The U.S.S.R’ and concluding with ‘Good Night’, sung by Ringo, the 30-song White Album features classics such as ‘Helter Skelter’, ‘While My Guitar Gently Weeps’, ‘Blackbird’, ‘Why Don’t We Do It In The Road?’, ‘Glass Onion’, ‘Birthday’ and ‘Revolution 1’. Chris, Phil, Josh and Tim stress that they’re not imitating John, Paul, George and Ringo. This is a celebration, not a tribute band. The White Album – which followed The Beatles’ venture to India and the death of their manager, Brian Epstein – is one of the 10 greatest albums of all time, according to Rolling Stone. The magazine’s founder and publisher, Jann Wenner, called it “the history and synthesis of Western music”. “When we first did it, we didn’t know what it would be, or how it would work,” Phil says. “It was an incredibly nerve-racking experience, because it’s a mammoth record and the material is so diverse. But we made it work. People really enjoyed it, and we got such a kick out of it. Tickets on presale 9th April and general on sale 13th April. CHRIS CHENEY is the lead singer and guitarist in The Living End, who have had eight Top 10 albums (including two number ones), 12 Top 40 singles, and won six ARIA Awards. Fun fact: Chris has met a Beatle – he met Ringo at a party in LA. 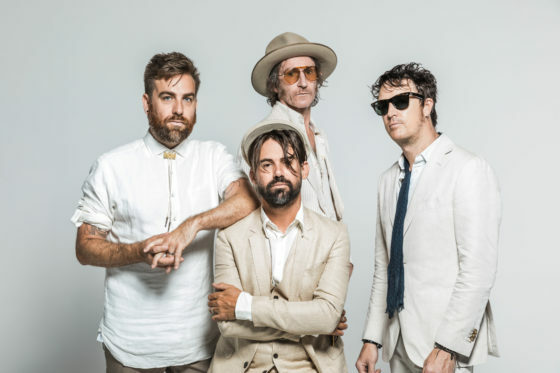 PHIL JAMIESON is the frontman of Grinspoon, who have released seven studio albums – all of which have made the Top 10 – and won two ARIA Awards. He also starred as St Jimmy in the Australian production of the Broadway musical American Idiot. Fun fact: Phil’s wife, Julie, walked down the aisle to the White Album’s ‘I Will’.